The Guam Youth Basketball Association used their size advantage to muscle their way to a 78-70 victory over Team Palau in the 2007 19-and-Under Micronesian Youth Basketball Association Tournament, hosted by the Guam Basketball Confederation, last night at the University of Guam field house. John Oqueno and Neil Apilado led a well-balanced attack with 14 points apiece for GYBA, who improve to 2-0. Dan Tulabo and Dioor Jones added 12 points each. 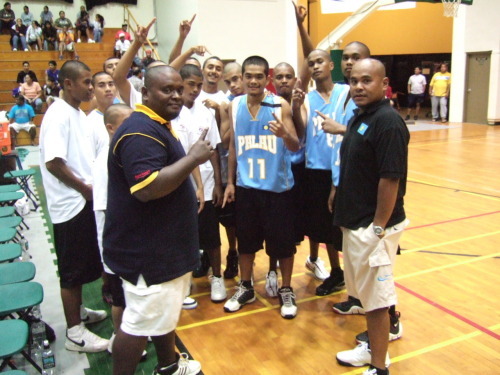 Perry Oiterong had a game-high 24 points for Palau (0-2). Saipan Southern Sonics 95, Chuuk 71: Ivan De Vero's 28 points and six rebounds powered the Sonics (1-1) to their first victory. Terles Charles had 19 points and 10 rebounds for Chuuk, who drop to 0-1 after an opening day bye. Team Guam 87, Guam Dragons 57. Team CNMI 77, Guam High School 55. CNMI 83, Palau 75: Jericho Cruz set the bar high as he scored a tournament-high 38 points on opening day. Teammate Bill Babauta added 19 points while Bedor Kyota led Palau with 21 points. Guam 98, CNMI 37: Lili Baranda's 26 points led Guam in a preview of the women's gold-medal game to take place on Saturday. Maeann Pajaro added 16 points for Guam while Chelsea Ruluked led CNMI with eight points.